The increase would amount to €12 extra a week for those working full-time. 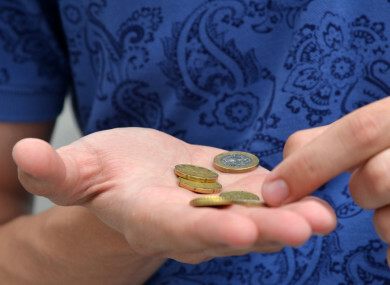 IT’S BEEN RECOMMENDED that the government increases the national minimum wage by 30 cent. The Low Pay Commission has released a report examining the state of the economy and recommending that the current minimum wage should be increased from €9.25 per hour to €9.55 per hour. Taoiseach Leo Varadkar welcomed the announcement today, admitting that it was “a modest increase” but also “ahead of the rate of inflation and average increases in earnings”. The government wants everyone to have an opportunity to share in the ongoing recovery. Increasing the minimum wage will help to achieve that goal by providing an absolute minimum for earnings. It would be the fourth increase in the minimum wage since 2011, but still leaves quite a gap between the minimum wage of €10.50 per hour that’s in the Programme for Government. Labour, although welcoming the move, has said that the minimum wage should be raised to over four times that amount to €10.50, saying that the current increase is a “very small step in the right direction”. “Frankly, this government has a lot to be modest about when it comes to delivering on its own promise that work should pay,” said Labour Senator Ged Nash. Tánaiste and Minister for Jobs Frances Fitzgerald also welcomed the recommendation, and said that she would introduce proposals to address zero-hour contracts, low-hour contracts, banded hours and other issues in the workplace. The government will review the recommendations after the summer recess, and the Budget for 2018 will be announced in October of this year. Email “Minimum wage: Taoiseach welcomes recommendation of €9.55 per hour”. Feedback on “Minimum wage: Taoiseach welcomes recommendation of €9.55 per hour”.